Today on the Gareth Bale update: Daniel Levy rejected the latest record offer, estimated at £95 million, from Real Madrid and continues to insist that the Welsh player stays with Tottenham this summer. CSKA Moscow’s president, Yevgeny Giner, attacks Milan for not closing a deal with Keisuke Honda: “We have received better and more worthwhile offers for him. Milan may be a big club, but they can’t treat us like losers”. 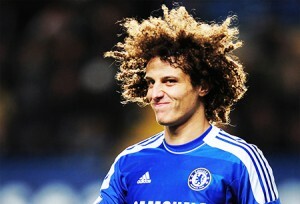 The Sun is claiming that Bayern Munich is going to make Chelsea an offer of £40 million for David Luiz. According to the report, the Bavarian defense’s weakness in the recent Supercup was the deciding point for Pep Guardiola to invite the defender he wanted since his Barcelona coaching days. Barcelona themselves are also interested in David Luiz. Luiz Gustavo, on the other hand, might be making the opposite way by the end of the summer. The Brazilian midfielder did not find his place in Guardiola’s line-up and is having talks with Chelsea, on top of Milan, Inter and Arsenal. The Daily Star reports that one of Tottenham’s alternatives for Gareth Bale is Javier Pastore, whos status with PSG is unclear. Thiago Silva officially extended his contract with PSG, and will remain with the club until 2018, for €12 million per season. More from PSG: L’Équipe reports that Zlatan Ibrahimovi? is also going to extend his contract until 2016. Following Chelsea and Monaco, PSG is also in the race for Sami Khedira’s signature. According to reports the French might get the player for €25 million. Is Manchester United trying to get rid of Nani? Monaco’s owner claims the Portuguese defender was offered to him: “They offered him to us. He is a good player, but we’re not having talks”. England reports that 20 year old midfielder Bernard has decided to transfer from Atlético Mineiro to Porto instead of Arsenal, after receiving advice from his national teammate Hulk. St. Étienne confirmed they are interested in Carlton Cole, now his contract with Westham is expired. Rémi Garde, Lyon’s coach, admitted that Bafétimbi Gomis and Jimmy Briand requested to be released from the team this summer, and got their request. Corriere dello Sport reports that Rafa Benítez asked Napoli’s managers to get Éder Álvarez Balanta, the 20 year old defender from River Plate. Gazzetta dello Sport claims that Napoli is thinking big, and made a €20 million offer to Barcelona for Alexis Sánchez.